IYAP’s Peace Ambassador Leadership Program (PALP), supported by the Active citizen, British Council Sri Lanka, conducted a special Pongal program to the participants of the PALP program as part of understanding the intercultural indifferences between ethnic communities. Pongal, the harvest festival celebrated to show gratitude to the sun god.Extensively celebrated between January 14-17 of every year to show gratitude to the sun god and Lord Indra for helping the farmers in better yielding crops. Often adorned with delicacies like Pongal, Sakkara Pongal and Sugarcane, the festival revolved around performing special pujas to thank the sun god. 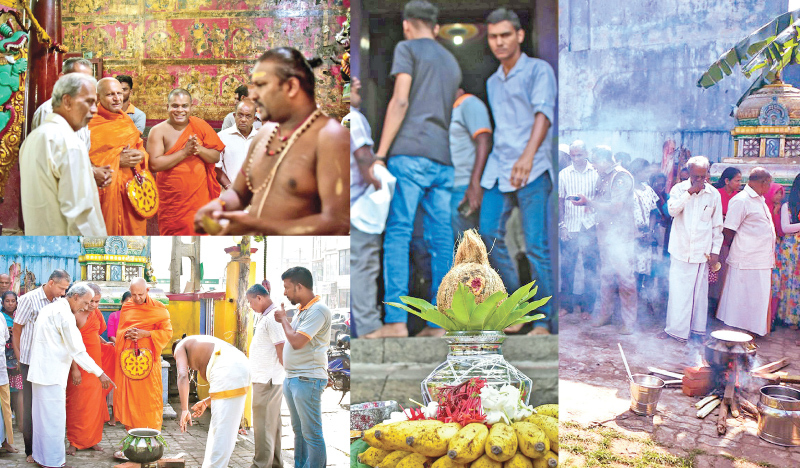 The event was conducted at the 229 year old ‘Naatukottai Nagaratthaar Shri Kathirvelaayutha Swami Kovil – Galle’ with more than 50 participants including its volunteers, religious scholars and government dignitaries. The event was graced by Ven. Visuddhi Thera, along with Farhan Moulavi, Southern Province Cultural Secretary Vernard Perera, Galle District ASP Ajith Kumar, and Member of Colombo Municipal Council Charitha Gunarathne along with the resident Kurukkals making it a truly multi-ethnic celebration. The special event commenced at 8:30am with the preparation of the delicacy of the day, the Pongal amongst participants, volunteers, friends and family along with the invited dignitaries. A special puja was then conducted by the resident Kurukkal in the presence of the respected religious scholars and government delegates. A sight to behold was when the local Buddhist monk was seen sharing fruits with all his Hindu and Muslim scholar friends and sharing a light hearted moment. The significance of the festival and its celebrations was explained and addressed to the gathering by one of IYAP’s PALP participant whilst the dignitaries, participants and volunteers were treated to Sakkara Pongal, Kesari, Vada and Laddu; some of the traditional Hindu sweets and savouries. Member of Colombo Municipal Council Charitha Gunarathne then followed up with a short speech pertaining to the improvements he wishes to see in the community in terms of education, work and play. He had extended his support to IYAP and the Kovil delegates for future projects and collaborations which could benefit in uplifting youth and emphasize peace and prosperity. “We at IYAP are glad to be able to bring young people from different religions in celebrating Pongal; an important festival for Tamils. This being part of the PALP initiative supported by British Council Sri Lanka, has truly been an experience of intercultural understanding and dialogue sharing in the southern part of Sri Lanka. Hoping this will be the beginning for many more such initiatives,” Founder President, IYAP Thirukumar Premakumar said. The event concluded with another PALP participant thanking the scholars, delegates and participants for the gathering. As part of the one-year program, the participants of PALP are trained, monitored and guided to actively participate and contribute to attain the end goal which is to encourage them to act, think and work towards a peaceful world ultimately becoming an active citizen.